The Society for Integrative and Comparative Biology conference was held January 3rd to January 7th this year. I presented another poster and had a fairly captive audience for almost the entire time (~ 2 hours), at least until I managed to sneak off to talk about a poster I was interested in across the display hall. 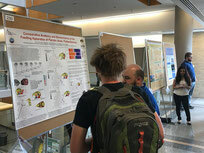 Parrots were not necessarily the rage, but the biomechanical work presented was very popular and since I love my work I am going to go with the idea that biomechanical parrots were some of the favorite things on the lists of people I spoke to on January 4th at my poster. This summer (2016) the 11th International Congress of Vertebrate Morphology was held in Bethesda, Maryland and I presented some preliminary, but well-on-their-way, results from my current work on cranial kinesis. The talk and the meeting went better than I could have hoped and a lot of interesting discussions resulted. Dinosaurs and Cavemen was again a resounding success. 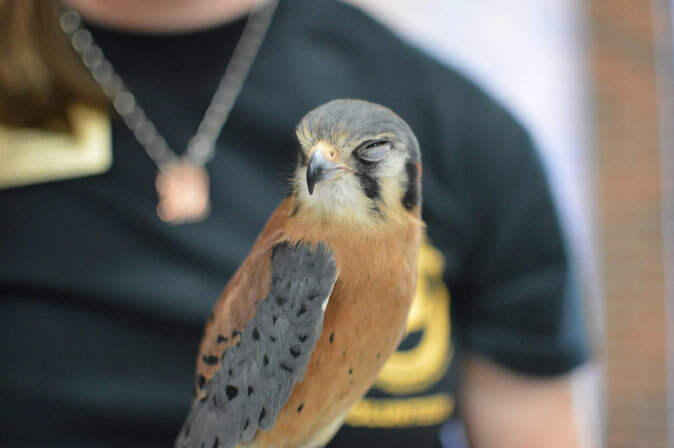 This year we had live dinosaurs (University of Missouri Raptor Rehabilitation Project brought live birds!) in addition to the hominid, dinosaur, avian, geological, and anthropological exhibits. We also had help from the planetarium at Columbia Public Schools and students from the College of Agriculture, Food, and Natural Resources who brought taxidermied representatives of Missouri birds with them as well. Life Sciences Week 2017 was a great success this week. The poster I presented was singled out as an outstanding poster for the best oral presentation in the social and behavioral science category. Feeding behaviors and different ways that the animals presented use their feeding apparatuses were highlighted for audiences from undergraduate level to faculty. The poster was displayed a second time at a reception showcasing the outstanding posters from the week. The Society of Vertebrate Paleontology (SVP) meeting in Dallas this year (2015) was a great networking event and the research and work that was done to that point was very well received. 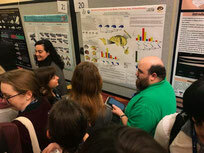 In this image of the poster session I am explaining the work to some interested students and some fairly well known scientists (Stephen Gatesy and Emily Rayfield) who were very nice to meet and discuss common interests with. Photo taken by Casey Holliday. The Experimental Biology Meeting hosted the annual meeting American Association of Anatomists this spring. At the meeting I presented a very similar, though not identical, poster as the one I presented at Life Sciences Week that shows a lot of the methods I will be using to address my future research. I was lucky enough to speak to a number of great anatomists about aspects of these methods and what kinds of information they will produce as well as speaking to collaborators that are helping to further my research. Using my own bird checklists I played around with some statistics and put together some graphs. It is a fun little data set and I enjoyed experimenting with it.